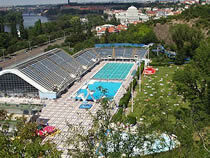 Prague's largest swimming centre, the Podoli Swimming Pool Complex is located near the Vltava River by Vysehrad Park. It is a ten minute tram ride from the city centre. Podoli consists of one Olympic sized 50m indoor swimming pool, two outdoor swimming pools of 50m and 33m in length, plus a paddling pool for children. The indoor pool is open all year round, as is the 33m outdoor pool which is heated in the winter months. The 50m outdoor pool and the paddling pool is only open during the summer. The Podoli Swimming Pool Complex is therefore worth a visit at any time of the year, although obviously it really comes into its own on a hot summers day. Naturally, good weather, especially at weekends, can bring the crowds flocking. But it seems to cope reasonably well, because the whole swimming complex covers a wide area. In the summer, as well as the outdoor swimming pools, sunbathers take to the large grass areas and patios. There are also food and drink stands, and music playing, making for a good atmosphere. Podoli also has a fitness centre, sauna and an indoor café/restaurant serving traditional Czech fare. From Prague's city centre the tram system operates an efficient service, whisking you out to Podoli in no time. And after your swim, if you fancy a long pleasant walk, stroll back along the river. The other major swimming pool in Prague is the Axa Swimming Pool. Axa is located on the opposite side of Prague from Podoli, and is in the city centre. Podoli is nicer, Axa is closer to the main squares, you take your pick!